Friday 4th April at 23.00. But anyone who accuses Mayra of abandoning her roots would be making a grave mistake. Her father fought for Cape-Verdean independence. When there were fears for his wife’s health during pregnancy, she left to have her child in Cuba, the “brother country”. Thus Mayra was born in Havana, but still spent her early childhood in Cape Verde. Aged six, with her mother and diplomat stepfather, they were on the move through Senegal, Angola and Germany, but aged fourteen she returned again to Cape Verde, to Praia on the island of Santiago. Here the musical styles are more percussive than those made famous by Cesaria Evora. The funana and batuque are genres that were frowned upon by the colonial elite but Mayra is passionate about them, and their subtle, gently swinging influence pervades the very fabric of this recording. Aged 28 and now living in Paris, Mayra has been fêted by the world’s press. 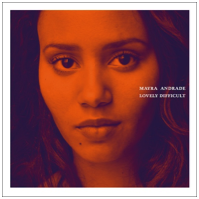 Mayra’s shows at Ronnie Scott’s elicited 4 stars from Robin Denselow in the Guardian and the full 5 from Clive Davis in The Times who wrote of “a majestic performance and a stunning night”. The normally reserved Scotsman recently wrote of her appearance at Celtic Connections, where she stole the show, “Mayra Andrade’s opening set, by contrast, was captivating from start to finish … (it) took in elements of jazz, chanson, ska, cabaret, torch-song, power-pop, and even a dash of rockabilly, matching sensuously elastic vocals with highly sophisticated songwriting.” We could hardly put it better and all are brought together, here in one complete whole, on ‘Lovely Difficult’.